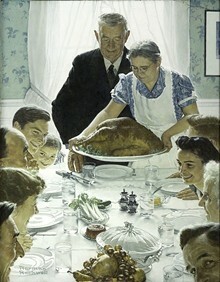 Norman Rockwell (1894-1978), Freedom from Want, 1943. Story illustration for The Saturday Evening Post, March 6, 1943. Illustrator Norman Rockwell's Four Freedoms paintings are among the iconic illustrator's most well-known and impactful works, helping rally the nation during World War II (and getting endlessly parodied in the years since). And now, they're on view at the Henry Ford museum.